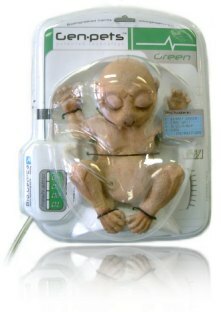 are mass produced Bio-engineered pets implemented today. Each pet comes pre-packaged as a fully self-contained unit. Genpets™ learn and adapt. They are fully living pets, but better, modified to be as reliable, dependable and efficient as any other 'technology' we use in our busy lives. Feature Advancements take Genpets™ beyond any other commercial product available today. Color Coding, Fresh Strips, Heart Monitors, Stasis Mode, embedded LCD displays, microchips, as well as the Genpets Network™ are some of the exciting ways we’re doing this.